Brancaleone Cugusi was born on 23rd September 1903 in Romana, a little town in the province of Sassari, son of the second marriage of the town’s doctor Leonardo Cugusi. Due to his excessive restlessness, to allow a little peace to his expectant mother’s second child, in 1905 he was sent to his maternal grandparents and aunts residents in Tempio Pausania. On reaching the scholarly age, in 1909 he was recalled to the family and enrolled into first elementary in Cheremule, where his family had moved. Brancaleone, who had learned to read and write from his grandfather a teacher, attended school for a few days, then refused to return and was sent back to Tempio Pausania. On completing elementary school, in 1914 he was enrolled into first class in middle school at the college Umberto I in Rome. With the outbreak of World War I, Brancaleone was hastily brought back to Sardinia and enrolled along with his brother Guglielmo, into Salesian College in Lanusei, where he would stay until high school. Leaving with honours, in 1920 he was enrolled into classical High School in Cagliari, from which he was withdrawn before the end of the school year due to severe bereavements in the family. In 1921 the newly born sister Vera died, followed soon after by his beloved mother Raffaela, leaving behind seven children. The little ones were welcomed to Tempio by his maternal grandparents, the older ones abandoned their studies and move back to Cheremule. Brancaleone frantically dedicated himself to painting. The father married for the third time, in 1923, with a young woman from Cheremule, Maria Antonia Branca, the marriage allowed the family to come back together and the boys could return to their studies. 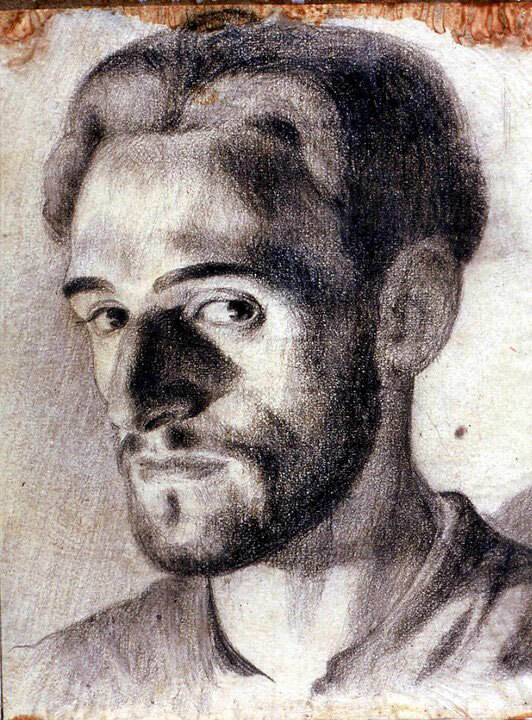 Brancaleone achieved the Classical high school diploma in Sassari in 1926. Having to choose the right university, he asked his father for a period of reflection. For a year he devoted himself diligently to painting. Urged by his family, in 1927, he decided to attend law school in Sassari. In the two years that followed he engaged little in study, mainly frequenting the artistic circles of the city, where he became friends with several artists. Life in Sassari was turbulent due to the open protest against him from the GUF, “Giovani Universitari Fascisti” – Young University Fascists, who considered some of his ideas and behaviours as provocative. Realizing his lack of commitment to study, his father called him into order in 1929. Brancaleone openly declared his desire to embrace a career in painting. At odds with his father he decided to go to mainland Italy, and in 1930 he visited his cousin Salvatore Meloni, a doctor in the town of Siliqua, from whom he obtained some money that allowed him to go to Milan where he remained for a few months as a guest of his uncle Onorato Cugusi. However, he could not get a loan on account of the veto imposed by his father to his uncles. And so he left for Rome and is guested by his uncle Efisio Cugusi, his father’s brother married to his mother’s sister Veturia Giua Branca . However, the double family relationship did not help him get his long-awaited funding. Stubbornly, in 1931, he rented an uncomfortable unadorned room near the Termini Station and worked designing poster advertisements, and then as a dress designer for “La Rinascente” under the pseudonym of “Navarra”. He rounded off his meagre income by selling some landscapes and still life. In 1933 his brother Guglielmo married Cesira Bachis, the daughter of the notary Francesco and Teresa Bachis, both wealthy landowners in Siliqua. From his sister-in-law Brancaleone obtained some loans. Sick and in debt, in the autumn of 1934 he returned to his father in Sardinia. In the spring of 1935 he went to Cagliari to visit the family of his brother Guglielmo, where he stayed as a guest for several months. Once back in health he painted the portraits of his brother and his wife Cesira. He received from her and her sister Alda a financial contract for the production of paintings, signed by the sisters. Brancaleone then returned to Cheremule and began with enthusiasm to paint full time. The funding period, which was to last 12 months, lasted for about four years, from 1936 to 1940. It was a period of continuous research, of reflection, and of the inevitable destruction of some of his work. Brancaleone abandoned small paintings to life-size portraits. His technique also evolved from smooth fine painting, to that of “half-paste” and then “whole paste”. He also perfected his technique of the grid. Off all the work he began, only around ten were brought to completion. He returned to Rome in 1940 and opened a studio in Via di Villa Ruffo which he kept for a little less than a year. He produced six pieces financed by Antonello Zintu, (a well-known scholar and art historian of Sardinian origin), and three financed by his uncle Efisio. In 1941 he returned to Sardinia, guested by his aunts in Tempio Pausania, where he created the last three paintings among which are his masterpieces, “Il Giovane con l’impermeabile” – (The Young man with a raincoat). They were later purchased by The Municipal Art Gallery in Milan, where he was invited to participate in a group of three (together with Mario Della Foglia, and Luigi Brignoli). Also in Milan, before the opening of the exhibition, he held a preview at his uncle Onorato’s house, to which they invited many distinguished guests of culture and art. On this occasion he got to know Nella Zoja, the friend who would stay beside him until his death. The climate condition in Milan didn’t help and his already precarious health got worse, he was admitted to a clinic where he died May 3rd 1942 at the age of thirty-nine, not yet made. On 31stof the same month his posthumous exhibition opened.